This Vanilla Brown Sugar Scrub recipe smells good enough to eat plus it’s super easy to make! A simply perfect homemade DIY! Homemade Sugar Scrub Recipes are a wonderful way to pamper yourself and smooth out those rough spots or give as thoughtful gifts without spending a ton. These are the kind of gifts I love! This Vanilla Brown Sugar Scrub is one of my favorites! I just have to keep telling my self not to lick the jar! Store bought varieties of body scrubs are lovely, they really are, but can be expensive or have questionable ingredients. It’s easy to make your own in less than 10 minutes with a few simple natural ingredients you might already have in your kitchen. My daughters helped make this batch and couldn’t believe how easy it really is. This Vanilla Brown Sugar Scrub smells so darn good and softens and moisturizes your skin beautifully. Scoop a small amount of the Vanilla Brown Sugar Scrub in your hands with a spoon. If you want the darling tag to go with your Vanilla Brown Sugar Scrub, click here. I’m definitely going to try this at home! And I agree that this is an awesome gift too! I love giving this as gifts! Put it in a pretty jar or bottle and you’re all set!! Print the tag for added cuteness! Erin, I think I would definitely have to remind myself not to lick myself after I apply this. It looks delicious. But I’m sure my skin would feel delicious after I used it. I love knowing that what I’m putting in my mouth is chemical free, and I have been paying far more attention to what I put on my skin too. What a perfect gift idea, one that the recipient will use to pamper themselves and I love giving a gift that shows that I took time and put thought into. This is perfect with the holidays right around the corner. Me too, Nikki. I’ve been paying way more attention lately to what I’m putting on my body and my kids. It just makes sense…too many chemicals in our environment. I just love how simple and lovely this pampering scrub is for a DIY. Wow Erin, just @WAYWOW. I can’t wait to try some of this. I love the smell of vanilla and using it as a scrub definitely works for me. I love the contrast the brown sugar brings to this recipe. Time to get to work on those dry feet from summer flip flops!! Enjoy, Michelle! I love the smell from these ingredients. My summer feet could use some pampering too! Pinned it. Thanks for sharing with us at Merry Monday. Mine too. My feet are dry and cracking, I am making a new flavor this week, so stay tuned! This will probably be my all-time favorite because it smells so good though. Hi I can’t wsit to try! What size jar does one batch make? You’ll love this scrub! The recipe makes about 1 1/2 cups. You can use it all in one container or make smaller ones. Whatever you prefer. Enjoy! I made this with the exact measurements you posted, but mine came out all runny. Your’s looks nice and thick like sugar scrub is supposed to… I tried adding more brown sugar, but it didn’t make much difference. What am I missing? That’s so strange, Ely. I used the exact measurements listed. I would say you’re on the right track. You can add more sugar until you reach the consistency you desire. If needed, once you add more sugar, add a teeny bit more vanilla. Hi Erin, I tried this and it came out looking like cookie dough. I wonder if I mixed it too much. Has this ever happened to you? Hi Devra, No, that’s never happened to me. I think you may be right, perhaps it was mixed too much. You are really just stirring to combine the ingredients and then leaving it alone. You used brown sugar? If using coconut oil do you melt it first? Hi Melissa, I use liquid coconut oil, so it’s not an issue. If you’re using solid coconut oil, you’d have to melt it a bit to be able to mix it all together. It will likely harden a bit after it’s mixed, though. I agree, simple and useful are the perfect combination! That’s a great website! Hi Francesca, there are free printable gift tags included in the post. You just need to click the link. Let me know if you have any problems. Hi! Where did you find your cute jars? I’m all about the cute jars! I usually find them at Michael’s and sometimes at Target. I also like this gasket one from Amazon http://amzn.to/2yhTRFn. Love this! Can you provide a link for the adorable jars? I just made this and smells delicious. Mine isn’t a lot drier the. What yours looks like. Any advice? Hi Stasha. Depending on what type of oil you used, that could happen. Just add a bit more oil until you reach your desired consistency. Just wondering if I can use regular coconut oil? I bought the liquid cooking coconut oil and wondering if that would be fine. Hi Kaci, In a pinch, I’ve used liquid coconut oil. However, in general it’s best to use regular since it has all the beneficial qualities you want in a beauty product. Where did you purchase you coconut oil? Hi Tammy, I purchase my coconut oil from several sources. Walmart has in inexpensive Organic one and recently, Costco started carrying an organic one as well. It’s large, but I cook and make crafts with it, so It’s not so bad 🙂 Amazon also has some -here’s one: https://amzn.to/2Hk8XxP. I’m excited to try this and give as as gifts for the holidays! Just wondering what type of brown sugar you used? I like to use any organic brown sugar, Melanie. However, any brown sugar (light or dark) you use will work. What can be substituted for vitamin E oil if I don’t have any? I would think most drug stores would carry Vitamin E in capsule form, then you stick a pin in it et voila, oil.. I have loved using vitamin E oil for many years now, my kids somehow ended up with warts one year (oh the things kids pick up at school!) and our doc sent us to a dermatologist who literally took off a piece of my pointer finger with his (true story!) LASER that he said was perfectly safe to remove them. I was so grateful that I listened to my gut and went first – we never went back to that derm, my Pop is a huge advocate of E for his dry skin so we all rubbed vit E on and no more warts. I still look at my hands and wonder how many people are missing part of a finger! Something about E and a lot of sunshine that summer, I had two places and comparing the laser to the one I just used E on… well, that got me very much into “home remedies”! Sorry for the life story 🙂 I just always want to pass on good news! Hi! I love your sugar scrub recipes. I made the pink lemonade and the vanilla lavender. 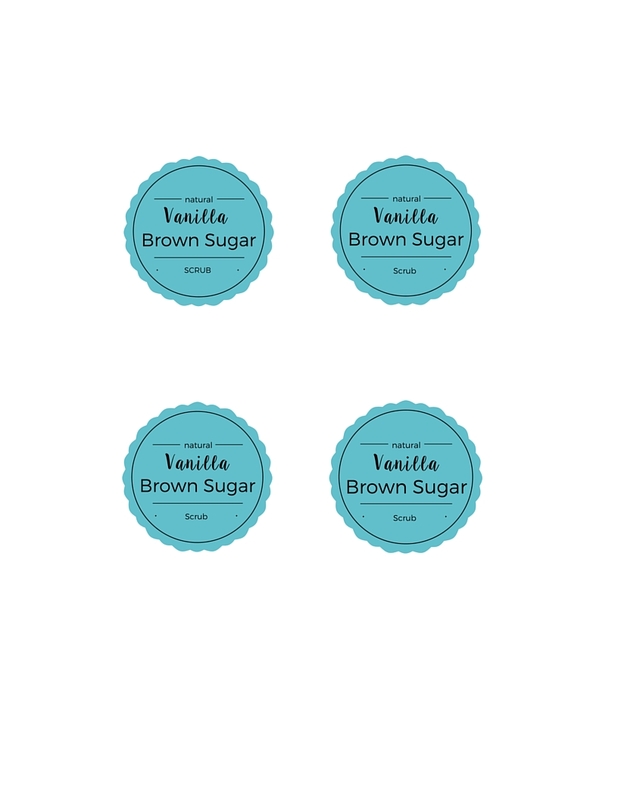 Is there any way you would be willing to share you labels for the vanilla lavender like you did for the pink lemonade? Thanks! Hi Mary, I will work on creating those in the near future! Thanks! hi Erin and thanks so much for these great ideas! I am teaching a STEM class with a DIY focus and your scrubs will be perfect. Happy to share your blog address too! Quick question-Worried about the food coloring staining hands. Have you had any issues? Wondering if I should look for a safe colorant. Any advice would be so appreciated! So what oil did you use to make the sugar scrub? I am confused? I want mine to smell good! The vanilla usually makes mine spell amazing, especially mixed with the sugar. I usually use coconut oil in mine. You could also try almond oil, which has a lovely smell. Good question. It get the most therapeutic benefit, I would use non-fractionated coconut oil. I just melt it in the microwave to get it soft enough to mix together. If using coconut oil, won’t it solidify? Hi Julie, good question. Because it’s mixed with the other ingredients, it is a nice consistency for using as a scrub. If you use within a month or two and keep it in an airtight container is should be good! Tried it with coconut oil. It was great for the first use, but the leftovers solidified. My daughter made something similar for me and it was just fabulous. I loved using it, especially on my hands. Pinned. So glad you share with us at Merry Monday. See ya next week!